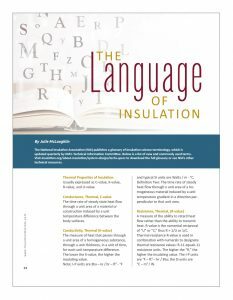 The National Insulation Association (NIA) publishes a glossary of insulation science terminology, which is updated quarterly by NIA’s Technical Information Committee. Below is a list of new and commonly used terms. Visit insulation.org/about-insulation/system-design/techs-specs to download the full glossary or see NIA’s other technical resources. The measure of heat that passes through a unit area of a homogeneous substance, through a unit thickness, in a unit of time, for each unit temperature difference. The lower the K-value, the higher the insulating value. Note: I-P units are Btu – in / hr – ft2 – °F and typical SI units are Watts / m – °C. Definition Two: The time rate of steady heat flow through a unit area of a homogeneous material induced by a unit temperature gradient in a direction perpendicular to that unit area. A measure of the ability to retard heat flow rather than the ability to transmit heat. R-value is the numerical reciprocal of “U” or “C,” thus R = 1/U or 1/C. Thermal resistance R-value is used in combination with numerals to designate thermal resistance values: R-11 equals 11 resistance units. The higher the “R,” the higher the insulating value. The I-P units are °F – ft2 – hr / Btu; the SI units are °C – m2 / W.
The combined thermal value of all the materials in an insulation system, air spaces, and surface air films. The heat transmission in unit time through the unit area of a material or construction and boundary air films, induced by unit temperature difference between the environments on each side. The I-P units are Btu / (hr – sq ft – deg F temperature difference) and the SI units are W / (sq m – deg C temperature difference). Note: This heat transmission rate has been called the overall coefficient of heat transfer. Definition 1: Insulation applicable within the general temperature range of –300°F to 1800°F. Definition 2: A material or assembly of materials used to provide resistance to heat flow. Discussion—The three terms “jacketing,” “lagging,” and “cladding” are considered synonymous in most metal jacket related applications and geographies. However, in some cases in the power industry in North America the term “lagging” has a different meaning than “jacketing” or “cladding” and refers specifically to a heavier gauge of jacketing. The texture of the metal surface. Discussion—The 3 terms “jacketing,” “lagging,” and “cladding” are considered synonymous in most metal jacket related applications and geographies. However, in some cases in the power industry in North America the term “lagging” has a different meaning than “jacketing” or “cladding” and refers specifically to a heavier gauge of jacketing. Definition 1: A block material for insulating tanks and boilers, usually curved or tapered, and can be made from any of several insulation materials. Definition 2: Insulation used on pipe, tanks, ducts, vessels, or other mechanical equipment. Discussion—Lagging insulation is usually applied in the form of cut, pieced together, or mitered parts. A product made by bonding together 2 or more layers of material or materials. A thin, flexible sheet material intended for use as a jacket over thermal insulation on pipe, duct, or equipment, and consisting of multiple layers of polymer film and aluminum foil bonded together. Discussion—A laminate jacket is available with or without a factory applied pressure sensitive adhesive. Discussion—Laminate jacket is commercially available in different widths, it typically is provided in approximate widths of pipe insulation sections. A thin, flexible sheet material intended for use as a tape to seal and secure a laminate jacket over thermal insulation on pipe, duct, or equipment. Discussion—Laminate tape always has a factory applied, pressure sensitive adhesive which first requires removal of a release liner. Discussion—Laminate tape is commercially available in several different widths. Discussion—A laminate tape can also include a polymer coating as a top surface. A white, flexible reinforced lamination with Paper as exposed layer which is used as a vapor retarder and finish for pipe, tank, and equipment insulation. A white, flexible reinforced lamination with Polymeric film as exposed layer which is used as a vapor retarder and finish for pipe, tank, and equipment insulation. N—A cellular material that will not rupture within a specified time when bent around a mandrel at a specified uniform temperature and rate. Discussion—Test Methods D3574 “Standard Test Methods for Flexible Cellular Materials—Slab, Bonded, and Molded Urethane Foams” provides a standard procedure for assessing whether an insulation material is a flexible cellular material. A mineral wool made usually from molten blast-furnace slag by the action of jets of steam under high pressure. Emissivity is for pure materials that are perfectly smooth. The ratio of the radiant flux given off (emitted) by a surface to that given off (emitted) by a blackbody at the same temperature and under the same conditions. Emittance is for rough and contaminated surfaces (practical surfaces). The ratio of the radiant flux given off (emitted) by a surface to that given off (emitted) by a blackbody at the same temperature and under the same conditions. Adsorption is the physical adherence or bonding of ions and molecules onto the surface of another molecule. Sorption refers to the process in which one substance takes up or holds another (by either absorption or adsorption). If you have questions or suggestions, please contact us at publisher@insulation.org.